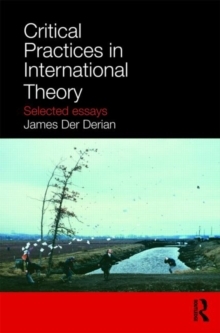 Critical Practices in International Theory brings together for the first time the essays of the leading IR theorist, James Der Derian. The essays cover a variety of issues central to Der Derian's work including diplomacy, alienation, terrorism, intelligence, national security, new forms of warfare, the role of information technology in international relations, poststructuralist theory, and the military-entertainment-media matrix. The book includes a framing introduction written for this volume in which Der Derian provides historical and theoretical context for a diverse body of work. Discussing his own influences and reflecting upon the development of international theory, he advocates a critical pluralist approach to the most pressing problems of world politics. Written in the eloquent style that marks out Der Derian as one of the most provocative and innovative thinkers in international relations, this collection is essential reading for scholars and students interested in the past, present and future of international relations. James Der Derian is a Watson Institute research professor of international studies at Brown University, where he directs the Global Security Program and the Global Media Project. He is the author of many articles and books, including the highly acclaimed Virtuous War (2001, 2009).